A 1st century AD inscription which was, technically though likely unintentionally, printed on a clay vessel has been discovered by the archaeologists excavating a Thracian tumulus (burial mound) repeatedly targeted by treasure hunters in the town of Tatarevo, Parvomay Municipality, in Southern Bulgaria. The Thracian inscription with Greek letters has been discovered by the archaeological team carrying out the emergency excavations led by the Director of the Plovdiv Museum of Archaeology, Kostadin Kisyov, reports local news site Parvomai.net. 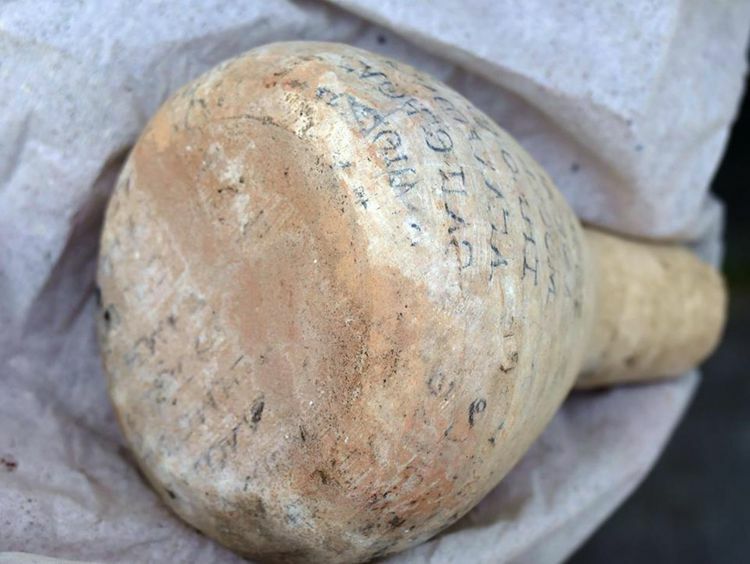 The vessel with the “printed" inscription is a balsamarium (an ancient vessel for holding balsam), and has been found inside the fourth, and most likely main grave which Kisyov’s team has unearthed so far inside the so called Great Ancient Thracian Mound in Tatarevo. Several days ago, in the second grave found in the tumulus, the archaeologists unearthed the tomb of a cremated Thracian princess. When they first found the clay vessel with the inscription on it, the Bulgarian archaeologists were surprised because ancient inscriptions on vessels are usually engraved while the one from the Tatarevo Mound appears to have been printed, with straight lines of letters. However, they have figured out that the “printing" on the balsamarium was most likely accidental, after the vessel was wrapped in a parchment on which the actual text was written. The letters were written with ink made from cinder and natural dyes that left an imprint on the clay vessel. The hypothesis that the printing was unintentional is also confirmed by the fact that on one of its sides the lines of letters are horizontal, while next to that they appear at an angle, and the bottom has an imprint from the folding of the parchment. What is more, because of the imprint, the letters are backwards, and will have to be reversed before the Ancient Thracian inscription can be read and its meaning can be interpreted. First, however, it will be conserved. It is possible that the inscription might contain the name of the man buried in the fourth and possibly main grave found by the archaeologists under the Tatarevo Mound, or that it might be a dedication or an oath. In any case, it indicates that the local Thracians were literate. They used Greek instead of Latin letters even though by that time – the second half of 1st century AD – they were already part of the Roman Empire (Rome conquered all of Ancient Thrace south of the Danube in 46 AD, with the Thracian aristocracy generally becoming absorbed as Roman provincial aristocracy). The balsamarium with the “printed" inscription is one of the vessels found in Grave No. 4 of the Great Mound in Tatarevo which is the last one that has been discovered by the Plovdiv archaeologists, and is thought to have been the central tomb in what appears to have been a family burial mound. Not unlike the burial of the Ancient Thracian princess in Grave No. 2 of the same mound, the person buried in Grave No. 4 was also cremated. The corpse was placed in a rectangular pit with dimensions 2 by 3.5 meters, it was covered with firewood, and was burned. In the northeast corner of the grave, the archaeologists have found funeral inventory consisting of 5 clay vessels and a small iron spear tip; these artifacts have been preserved because they were placed in the grave after the cremation. Another discovered artifact is a metal fragment from sole of a man’s sandal. Two other graves have also been found in the Great Mound in Bulgaria’s Tatarevo. Grave No. 1 was lying at a depth of 3 meters below the surface of the mound, and was a Christian funeral in which the corpse was placed in the east-west direction, with the hands crossed on it. Grave No. 3 is the grave of a child who was also cremated; it was found 9 meters beneath the surface. Grave No. 2, i.e. the grave of the Thracian princess, which was found at a depth of 6 meters, was more precisely dated thanks to the discovery of a large clay basin with seals indicating that it was made ca. 90 AD. The finds from the Ancient Thracian burial mound in Tatarevo – including the clay vessel with its “printed" inscription – will be exhibited after the end of the excavations and the restoration of the artifacts in the National Museum of History in Sofia and the Plovdiv Museum of Archaeology. 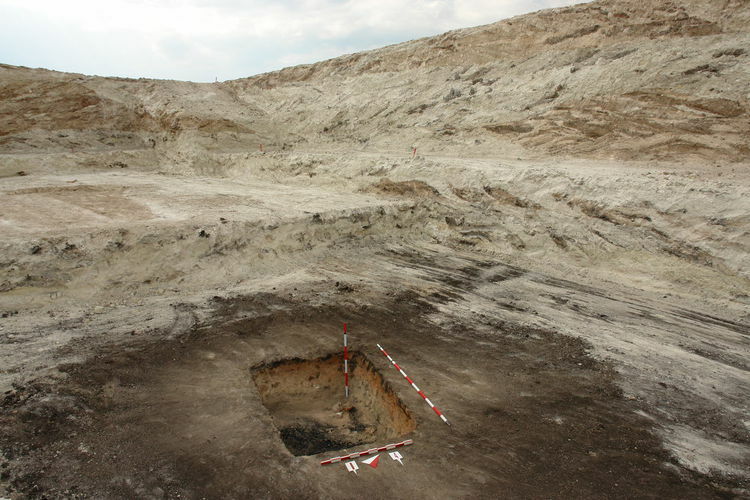 The excavation of the Ancient Thracian mound in Tatarevo is one of the not so many cases in which the Bulgarian archaeologists have managed to beat the ruthless treasure hunters looting the country’s thousands of archaeological sites, after Plovdiv Municipality has provided emergency funding for the excavations, and after the Thracian tumuli in Tatarevo were targeted by treasure hunters as recently as June 2015. Back in 2013, through emergency excavations, Kisyov managed to save from treasure hunters six Thracian funerals found under the so called Pamuk Mogila mound in the town of Brestovitsa where the most impressive discovery was a very rare war helmet of a Thracian aristocrat from the 1st-2nd century AD, which was recently showcased for the first time, and, at least judging by the readership of ArchaeologyinBulgaria.com, generated global interest. You can learn more about the Ancient Thracian burial mound known as Pamuk Mogila in the Background Infonotes below. Treasure hunting and illegal trafficking of antiques have been rampant in Bulgaria after the collapse of the communism regime in 1989 (and allegedly before that). Estimates vary but some consider this the second most profitable activity for the Bulgarian mafia after drug trafficking. One recent estimate suggests its annual turnover amounts to BGN 500 million (app. EUR 260 million), and estimates of the number of those involved range from about 5 000 to 200 000 – 300 000, the majority of whom appear to be impoverished low-level diggers.